The best—and most—support for your students. 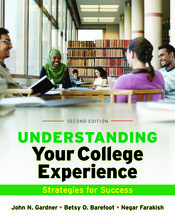 Understanding Your College Experience is designed to give the students who need the most support the practical help they need to successfully make the transition to college and get the most out of their time there. For this new edition of the text, John N. Gardner, Betsy O. Barefoot, and Negar Farakish share their commitment to institutions, instructors, and students with new coverage of non-cognitive skills like motivation and resilience alongside the authors’ hallmark authoritative, research-driven approach. Every aspect has been crafted to address the needs of the widest possible range of students, from content coverage and organization, to activities, assessment, and design. Students and instructors will benefit from our powerful LaunchPad course space including an ebook; a rich trove of videos; LearningCurve, an adaptive, game-like study system; and more. A full package of instructional support materials provides new and experienced instructors all the tools they will need to engage students in this course and increase student retention. Also available: ACES, a nationally norm-referenced student self-assessment of non-cognitive and cognitive skills.